LEAD IN: A Clean Air Action Plan aims to keep the sky above Long Beach, California’s port as clean as the surf and sand. US ports are taking sustainability into account. US ports are extending the lifespan of their investments. US ports are considering changes to their surroundings and other sustainability factors. Having fueled smog and pollution around the globe since the advent of the modern shipping industry, ports haven’t had the best environmental reputations. Yet stewardship, public perception and new regulations have driven many to significantly clean up their acts over the past decade. Some U.S. ports are even becoming models of environmental leadership with investments, programs and initiatives that conserve resources, minimize emissions and take a holistic view of their impacts on the community. Leading ports say things like clean truck programs, equipment upgrades, shore-side electricity and emission reduction strategies can go a long way in positively impacting both their operations and the natural environment. And while ports may also face uncertainty about regulations and capital for upgrades, their commitment to their communities and environments remains strong. A recent National Port Strategy Assessment by the EPA found there are many strategies and technologies that can help reduce port emissions and harmful pollutants. This includes things like replacing older equipment and outdated diesel fleets, implementing operational improvements to reduce idling and switching to cleaner fuels. The EPA report said upgrading equipment alone could provide significant reductions in NOx and PM2.5 emissions. Since implementing its Green Port Policy in 2005, Long Beach has driven clean truck programs and installed shore-side electricity. At the nearby Port of Los Angeles, Christopher Cannon, director of Environmental Management, says they are installing at-berth emissions control devices and testing a smokestack “hood” that would collect and treat emissions from cargo ships. The port is also aiming to become the first terminal in the world to operate entirely on zero-emissions equipment. Cannon says the terminal will be fueled by a $27 million solar and microgrid with 2.6 MW of battery storage. “It’s attracting a lot of attention, even from the federal government, because of the benefit of being able to operate a terminal in the event of an emergency. If there [was a blackout] it could still operate,” Cannon says. Improving air quality is also a priority in Texas, especially in the Houston-Galveston-Brazoria region. The Port Houston utilizes new technologies, alternative fuels, an employee vanpool program and strategic fleet replacement with low-emission vehicles as part of a formal Clean Air Strategy Plan aimed at reducing real and sustainable maritime and port-related emissions. The Port of Corpus Christi Authority has implemented a strategic plan “to ensure its continued economic success while ensuring its operations and activities are conducted in a manner conducive to environmental sustainability and resiliency.” A revised environmental policy recently implemented by commissioners identified five key precepts to be considered when evaluating new developments and operations: air quality, water quality, soils and sediments, wildlife habitat and environmental sustainability. Last year, the nation’s fifth largest port in total tonnage became the first in Texas to join Green Marine, the biggest voluntary environmental program for the maritime industry in North America. “Green Marine certification aligns well with our strategic initiatives with regards to the environment and sustaining the clean air, water and soil that we have in our port,” explains Sarah Garza, Port of Corpus Christi Authority’s director of Environmental Planning & Compliance. Many ports around the country are making big strides in reducing their environmental impacts. At the Port of Baltimore, the Dray Truck Replacement Program has replaced more than 130 trucks since 2012 and significantly reduced turn times. The Port of Portland has invested $3 million in energy efficiency improvements and aims to reduce greenhouse gases by 15 percent by 2020. The South Carolina Port Authority is also installing solar panels on the warehouse roofs of two of its terminals, something it says will generate 3.6 megawatts of electricity. And the Port Authority of New York and New Jersey used cleaned dredged material to restore several marsh islands in Jamaica Bay. New software applications and the Internet of Things are also enabling ports to make their operations more efficient. Cannon says the Port of Los Angeles is working on a new information portal that will enable port operators to obtain more updated information on cargo aboard incoming ships. As the port typically can’t obtain that information until 24 to 48 hours before arrival, having more real-time access to cargo information would allow them to prepare, sequence and move equipment more efficiently. “By being more efficient with how we move cargo at terminals and how we get cargo in and out of the port, it allows for much greater efficiency in terms of all the steps in the movement chain and reducing emissions,” Cannon says. Port Canaveral recently received its environmental certification and became the 100th port to join the Green Marine program, a North American environmental certification program for the marine and port industry. Robert Musser, director of Port Environmental at the Port of Canaveral, says the port has implemented many “top-down” programs to reduce the environmental footprint with actions and measurable results. As system-wide equipment upgrades can be costly, some ports are challenged with raising the capital they need. 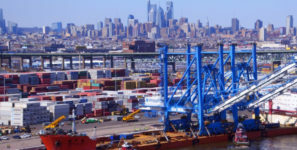 According to a report by the American Association of Port Authorities, U.S. ports and partners expect to spend nearly $155 billion on infrastructure upgrades by 2020. Yet AAPA noted that at “best case,” the federal government might only invest up to $25 billion during that time. Donnell Jackson, the Port of New Orleans Media Relations manager, says sustainable improvements cost more in nominal terms but are often comparable to traditional infrastructure costs after factoring in things like reduced resource expenditures, quality of life improvements and impacts to natural environments. The Port of New Orleans has a Department of Sustainable Development team with a certified LEED Associate Professional and certified Environmental Sustainability Professional who can quantify and value projects. “When taking sustainability into account, we are extending the lifespan of the investment by considering changes to our surroundings as well as other sustainability factors,” Jackson says. “We’re developing strategies now to address that, to make sure that our business can continue to operate with the highest level of environmental stewardship,” Sinkoff says. Musser says with the potential for more infrastructure funds on the way, a streamlining of multiple layers of regulations could help reduce some “logjams” in the system. He says while some “fine-tuning” to existing regulations could help reduce friction, it wouldn’t impact Port of Canaveral’s commitment to the environment and community. “Regardless of what happens [with regulations], I foresee programs continuing because it’s not just a sustainability issues. It’s a steward issue. The port is responsible to the citizens and taxpayers of Broward County,” Musser says.